Two-week hospitalizations. Breathing treatments four times a day. Taking enzymes with every meal. Life with cystic fibrosis is anything but easy. Here at Streetlight, we have a Cystic Fibrosis Team that is educated about, and committed to, our friends with cystic fibrosis. So what does that support look like? Two week “tune-ups,” or hospital admissions, can occur several times a year for those with CF. While at Shands, they can hang out with a Streetlight member while roombound. Once an admission, your Streetlight friend will take your order and deliver you a delicious free meal thanks to our generous community partner, BJ’s Restaurant and Brewhouse. The Cystic Fibrosis Team united to design a shirt unique for our community. 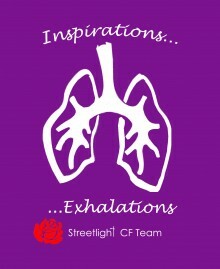 The color purple and roses are important symbols for CF so we integrated them into our “Inspirations and Exahalations” shirt. Make sure to ask your Streetlight friend for a CF shirt. Our Streetlight Cystic Fibrosis Team participates in and fundraises for the Cystic Fibrosis Foundation’s Great Strides 5K annually. The event includes the walk, games, raffle prizes, and great free food at Albert Ray Massey Westside Park in the month of April. The team also organizes awareness and fundraising events in the month of May for Cystic Fibrosis Awareness Month.